The Serengeti is one of Africa’s largest national parks – it stretches across the North-Western corner of Tanzania, all the way to the Kenyan border (the Serengeti and Kenya’s Maasai Mara are joined and are actually part of the same ecosystem). It’s 30,000 square kilometers of grassy green plains, punctuated by the occasional flat-topped acacia tree and rocky outcroppings called kopjes. Home to a huge variety of widlife, the Serengeti really is one of the most amazing natural wonders of the world. It was also the inspiration and (fictious) setting for Disney’s “The Lion King” – you may even recognise this scene from the cartoon…. 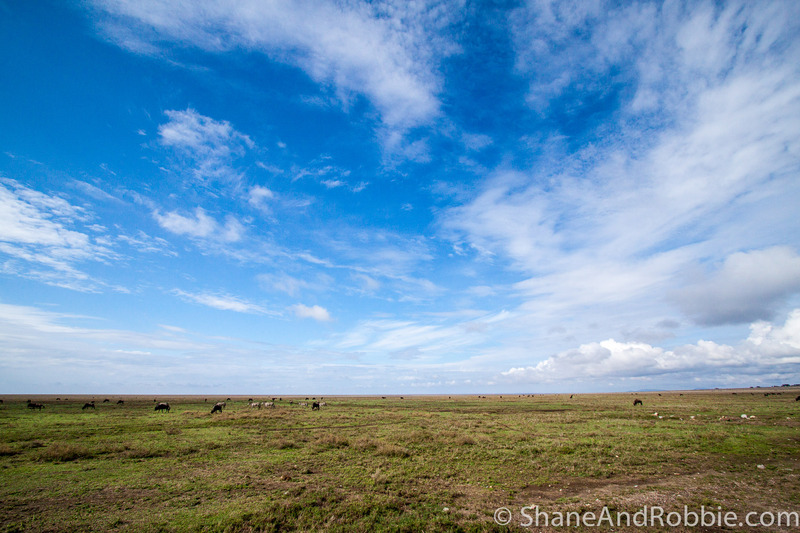 The endless plains of the Serengeti. 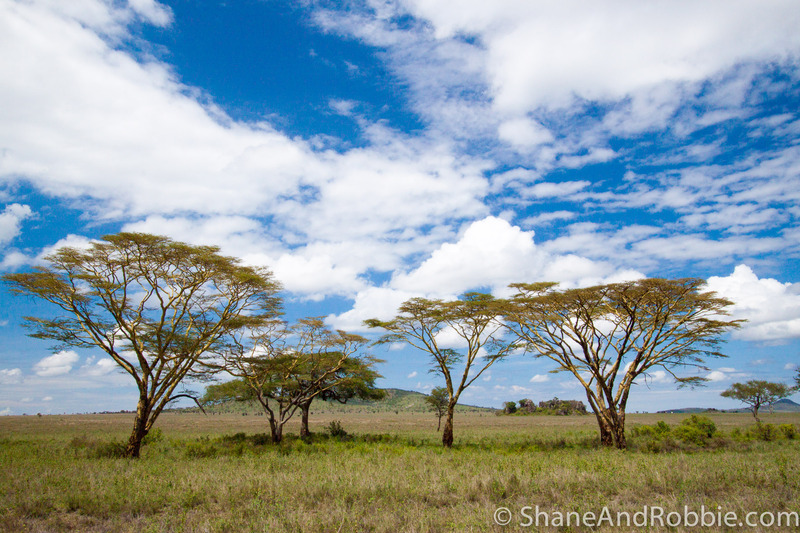 We spent our day today driving through the Serengeti, around the park’s heartland (often referred to as the Seronera region). During our epic 10 hour game drive we saw elephants, giraffe, gazelles, hippos, ostrich, jackals, hyenas, a wholehost of different birds and, of course, a huge number of migrating wildebeest and zebra. At one point we stopped and climbed a kopje to get a view over the surrounding landscape and all we could see for miles around us was a sea of grazing animals. It was amazing. The highlights of the day, however, were the big cats. 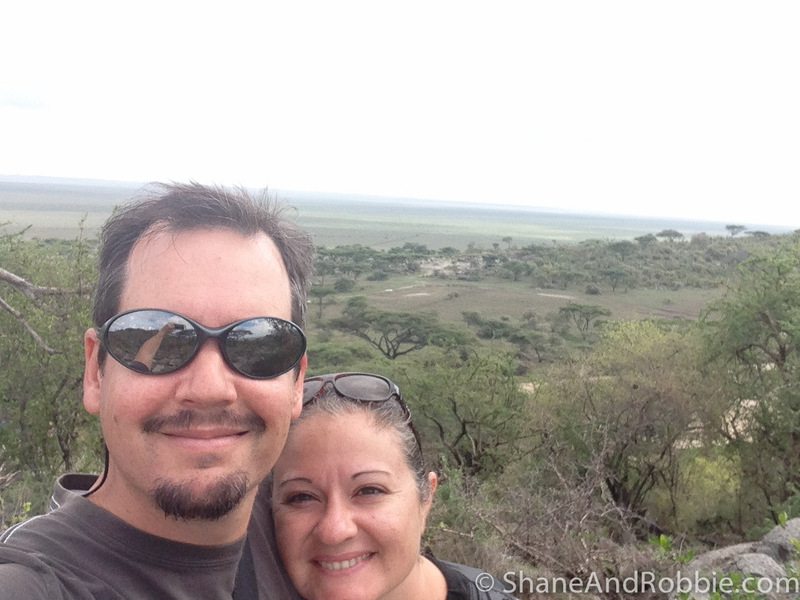 The Serengeti is home to Africa’s largest population of cheetah, lions and leopards and we got to see them all today! 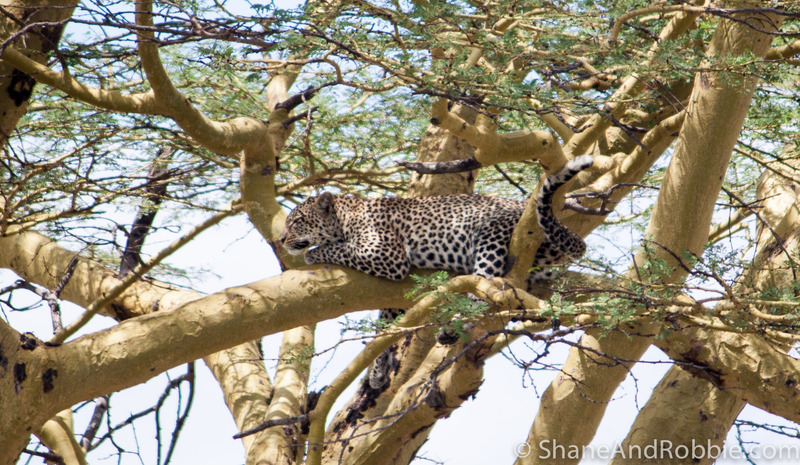 First up we came across a young female leopard asleep high in a tree. Leopards are generally elusive, nocturnal and solitary animals, so seeing one at all whilst on safari is generally considered to be a big deal. Although they’re the smallest of the big cats, they’re still pretty impressive with their long tails, spotted hides and muscular bodies*. *Leopards are really strong – they haul their kills up into the trees to ensure the carcass isn’t stolen by lions or hyenas. Sometimes the carcasses weigh more then the leopard itself and they drag it 5-10m up the tree whilst holding it between their teeth! Ah – there she is! 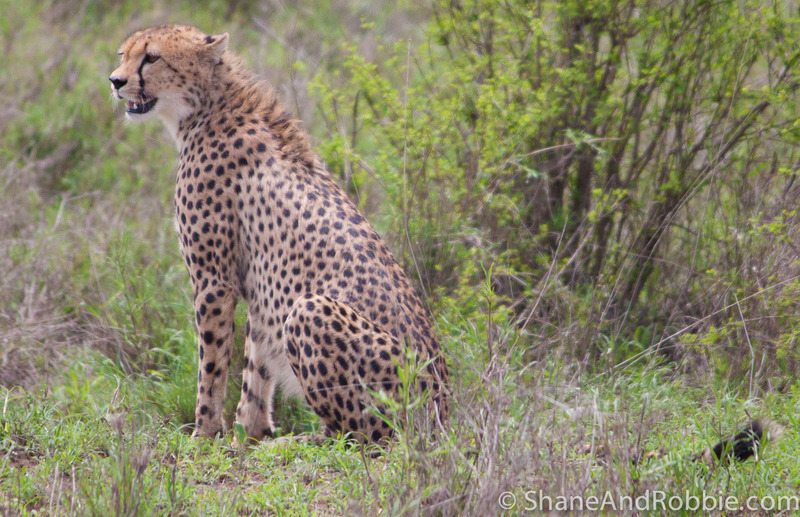 We also got to see a couple of young male cheetahs, brothers no doubt*, setting out to hunt. Like leopards, cheetah have spotted fur, though they’re much leaner then their tree-climbing cousins. Built for speed, cheetah are famous for being the fastest land animal (they can reach speeds of up to 120 km/h and accelerate from 0 to 100 km/h in just 3-4 seconds). They’re amazing to watch – very graceful and beautiful, in a deadly/predatory kind of way. *Female cheetah always live alone, except when they are raising cubs (they raise their cubs on their own). Males, however, stay with their brothers for life and hunt together as a group. The cheetah’s spots make them surprisingly well camouflaged. We watched these 2 young cheetahs scoping out a herd of gazelle, preparing to hunt themselves some lunch. 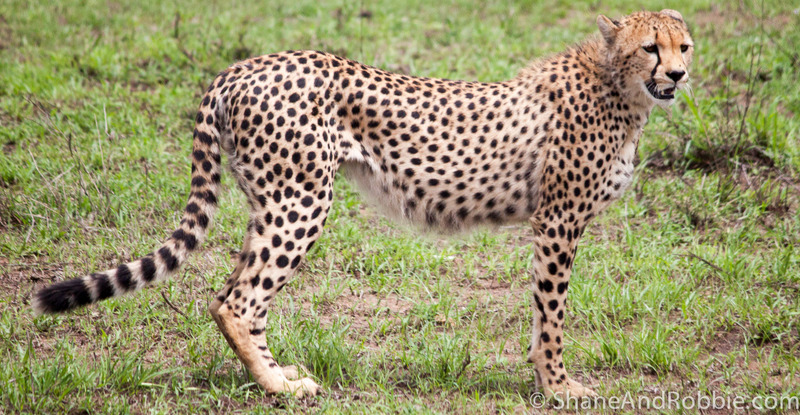 Tall and lean, cheetah are built for speed. Finally, we also got to watch a pride of lions devouring a recently killed buffalo. It’s a cliche, we know, but lions are so majestic. This was a large pride of 23 (18 adults and 5 cubs), with a single male lording it over his harem of females and offspring*. The 800 kg carcass of the dead buffalo was lying on its side its innards torn out. The adults had obviously had their fill for the time being, however, as the cubs were playing with the carcass. No doubt the buffalo was killed last night (lions usually hunt nocturnally) and the adults had eaten their 20-30 kg of meat already. The lionesses and male lion were flat on their backs under a nearby tree, fat bellies pointing skywards. Lions sleep up to 20 hours per day, and with that much dead buffalo in their bellies, we didn’t expect to see too much action from the well-fed beasts. We watched the cubs for a while however, as they practicing their pouncing and attacking skills for a later date when it will be their turn to hunt and “bring home the bacon”, so to speak. *Lions are the most socially inclined of all the wild cats, living in family groups of 5 to 30 beasts. Prides generally consist of at least 5 females, their cubs and a male that acts as the pride’s protector against annoyances like hyenas. Sometimes 2 related male lions will form an alliance and rule a pride jointly. Ruling males are ousted from their position of supremacy once past their prime, with most males lasting 5-6 years in the “top job”. Once they reach maturity (around 2-3 years of age), young male cubs are forced to leave the pride by their dad and live as solitary “nomads”. These nomads are always on the look out for a pride of their own however and may challenge an ageing male for the lead role or even steal a young lioness or two and start their own, new pride. Unless they are nomads, male lions don’t tend to do any of the hunting – that’s all down to females (though at least the male lion watches the cubs whilst waiting for the lionesses to return from the hunt). The lions, cheetahs and leopards were incredible to watch (from the safety of a safari vehicle, that is). Not that all the other creatures we got to see weren’t amazing as well, it’s just that those big cats can be quite hard to spot and it’s not often you get the privilege of being able to observe them all in one day, in the wild just “doing their thing”. Certainly of all the places we’ve been on safari so far, the Serengeti ranks up the top as one of the best places to observe nature at its best!